Mexican pork chili with a smoky barbecued flavor served in crispy tortilla shells with ripe avocado. Heat the oil in a large frying pan, add the onion and cook for 5 mins until softened. Sprinkle over the spices and cook for 1 min more. Add the mince, breaking it up with the back of a wooden spoon, and stir until cooked through. Stir the passata and barbecue sauce into the pan along with 4 tbsp water. Increase the heat and allow the sauce to bubble and reduce until it clings to the meat. Add the beans, season and cook for a further 2 mins, then stir in the coriander. Heat the tacos following pack instructions. 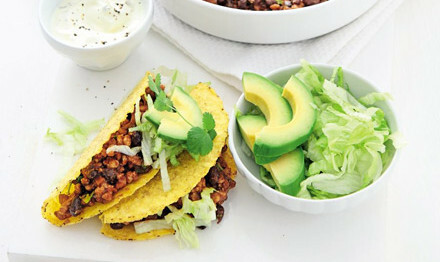 Use the pork and bean mix to fill the tacos, top with slices of avocado, shredded iceberg lettuce and a dollop of soured cream, if you like.